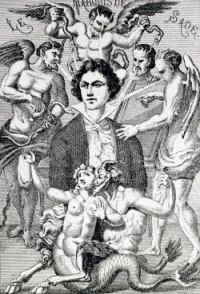 "I swear to the Marquis de Sade, my lover, never to be but his alone. ... Never to get married, nor give myself to others, and to be faithfully attached to him, as long as the the blood that I use to seal this oath runs through my veins. I give him the sacrifice of my life, my love and my feelings, with the same ardour that I gave him my virginity. (...)" (translation JW Geerinck). Unless indicated otherwise, the text in this article is either based on Wikipedia article "Anne-Prospère de Launay" or another language Wikipedia page thereof used under the terms of the GNU Free Documentation License; or on original research by Jahsonic and friends. See Art and Popular Culture's copyright notice. This page was last modified 06:13, 15 September 2015.